Pamela is a lecturer in the School of Chemistry and Chemical Engineering at Queen’s University Belfast, since 2015. Prior to her lectureship, she was awarded a Marie Curie Fellowship between Northwestern, USA and Queen’s University Belfast, on marine inspired hydrogels. 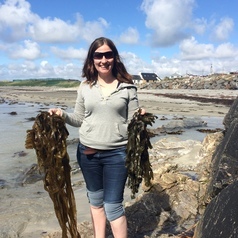 Her newly established research group, MMAG (Marine Material’s Application Group) focuses on marine biotechnology and is primarily funded by industry. Her earlier research focused on marine inspired and derived biomaterials for orthopedic applications. Recently her focus has shifted to more fundamental research on marine compounds and green extraction technologies to isolate compounds of interest for boarder applications.